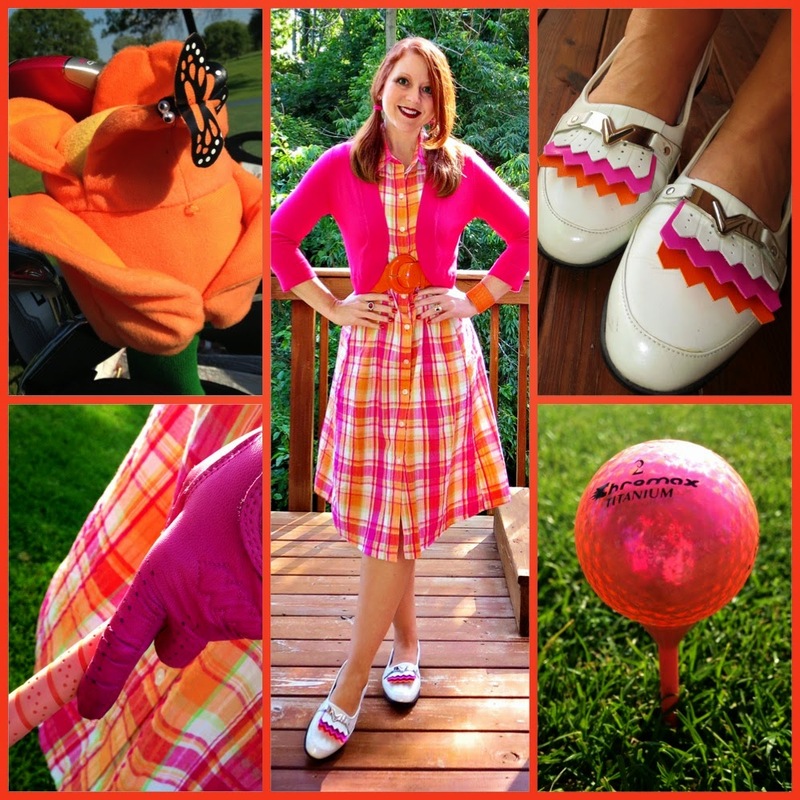 I don't know if it was the citrus striped Mary Janes; the circus bright color combination; the fact that I'd be going straight from the office to the golf course in 85 degree weather and wanted my hair off my neck; or if I was possessed by the spirit of Pippi Longstocking (one of my favorite ginger haired childhood heroines), but yesterday I made a spur of the moment decision to wear my hair in pigtails. This might not seem like a big deal, but I literally have not worn my hair this way since grade school. And, yes, I'm using the term "literally" in the correct manner...have you noticed how often people misuse it? It drives me crazy, but not "literally crazy." It actually just annoys me quite a bit. I love this fun, tulip-shaped headcover by Winner Edge Designs - it protects my new driver and coordinates with my golf bag and the orange grips on my irons. Speaking of saving time, I don't like to mess with lugging a change of clothes with me to the office, so I try to make sure whatever I wear to work will make a smooth transition for any after-hours activities on the calendar. I can't always accomplish this - I once attended a Killers concert in a black pinstripe business suit and felt like the only adult in a sea of skinny jeans-clad teenagers (though I don't think I was "literally" the only adult). I also can't really get away with wearing my softball uniform to the office. But for golf, it's pretty easy to get by with only a change of shoes. Literally! 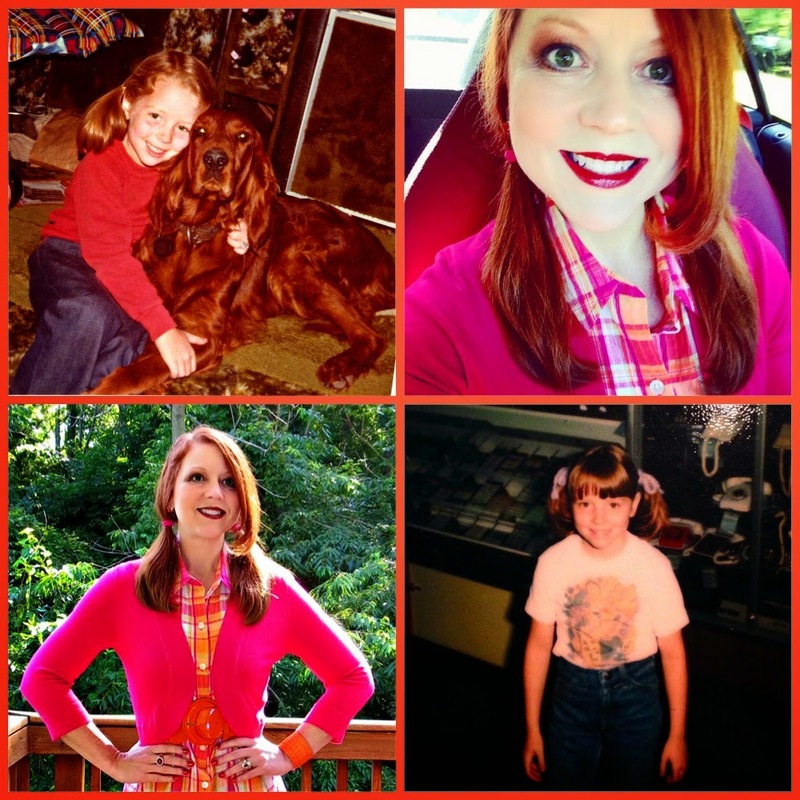 Then and now: even my beloved childhood dog Cinnamon, an Irish Setter, was a redhead; the bottom photo was taken at Service Merchandise (remember that place?) when my parents were testing out polaroid cameras. I don't remember wearing pigtails much after that, though I did have some unfortunate banana clip 'dos in middle school. Did you really play golf in a dress? I have always wondered about doing this! You embolden me, girl! Love your hair...and you! I have not forgotten about our golf date. It looks like I'm all the way out to August. My workload has been voluminous and then I've got a vacation and a batch of company, so that's why you haven't heard from me about a date!